DIY…Do it Yourself….Sew an Applique on Your Denim Blue Jean Jacket ! 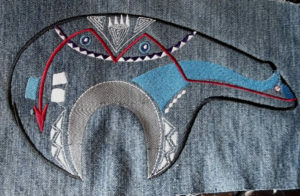 The Zuni Bear Fetish in Native American Culture has been around for quite some time, and while it's common to see the fetish made into jewelry and earrings, its colorful and unique minimalist style lends itself particularly well to DIY appliques that can be sewn on denim shirts as well as blue jean denim jackets. 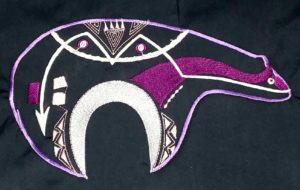 However, this is one of the prettiest embroidery patterns I have come across in the western-southwestern category I've seen so far and makes for an easy patch to sew on the back of a jacket. If you are one of the many that enjoy the western and southwestern culture with it's vibrant history and colorful artifacts, this is one quick and easy way to turn part of your wardrobe into a unique western colorfest. The west isn't dead yet! 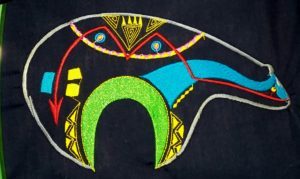 Each Zuni bear design itself is approximately 10.75 inches wide from left to right and approximately 5.75 inches from top to bottom. Surprisingly, each design can easily be stitched to a sweatshirt, shirt or jacket by spraying water soluble glue to the back of the bear, then press firmly to the back of the shirt or jacket. Select a matching color to the 'U' at the bottom of the bear and top stich next to the 'U'. Select a matching color for the arrow and top stitch next to the arrow along it's entire length. This will secure the bear to the garnet. 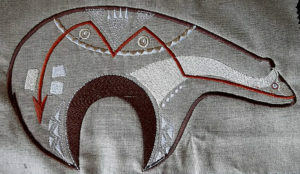 In color of your choice, zig zag a close, tight edge around the outside edge of the zuni bear. Crop close to the zig zag stitching. Sewn on a lighter weight black polyester cotton, these first 2 applique patches are easily adapted and sewn to a shirt using any home sewing machine. Notice that the first two are not for stitching to a denim jacket. The lighter weight material works bests on shirts and blouses that do not see daily wear. Please read full descriptions below each embroidered applique patch to choose the best one for your project. Each design is approximately 10.25 inches wide from nose to 'tail' and at its widest height, is approximately 5.75 inches high. Each design is $32.00….FREE FIRST CLASS SHIPPING WITHIN THE CONTINENTAL UNITED STATES. ZB-BLD-041 ighter weight black cotton polyester embroidered in bold colors of lime green and medium turquoise. Striking!. Best sewn to the back of a shirt or blouse that does not see heavy daily wear. ZB-TN–047 Sewn on cotton polyester with the lightest 'burlap-like' bkgrd pattern with a denim backing. Earth tone colors of dark brown, rust, tan and white. Can be sewn on a shirt or jacket. ZB-TNTQ–048 Sewn on cotton polyester with the lightest 'burlap-like' bkgrd pattern with a denim backing. 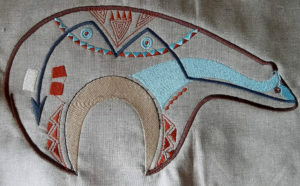 Earth tone colors of dark brown, rust, tan, white and contrast of jewel blue lt turquoise.. Can be sewn on a shirt or jacket. 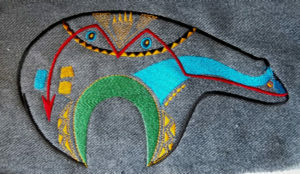 ZB-CLC-057 Sewn on Denim with also a denim backing, this zuni bear applique patch has bold color patterns of gold, black, lime green, red and medium turquoise. Great and Denim Jacket backs. ZB-CL-056 Sewn on Denim with also a denim backing, this zuni bear applique patch shows classic color patterns of black, silver gray, red and robbin's egg blue. Great and Denim Jacket backs.